Baskin-Robbins brings back Trick Oreo Treat ice cream as October 2018's Flavor of the Month and the fuzzy Fang-Tastic Monster Cake to help celebrate Halloween. 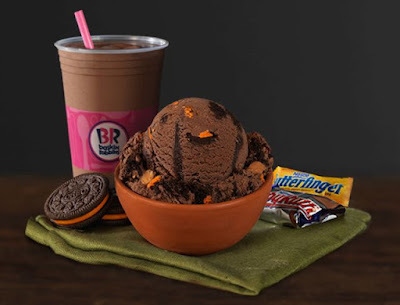 Trick Oreo Treat features vanilla ice cream with orange-colored creme-filled Oreo cookies plus pieces of Baby Ruth and Butterfinger candy bars. 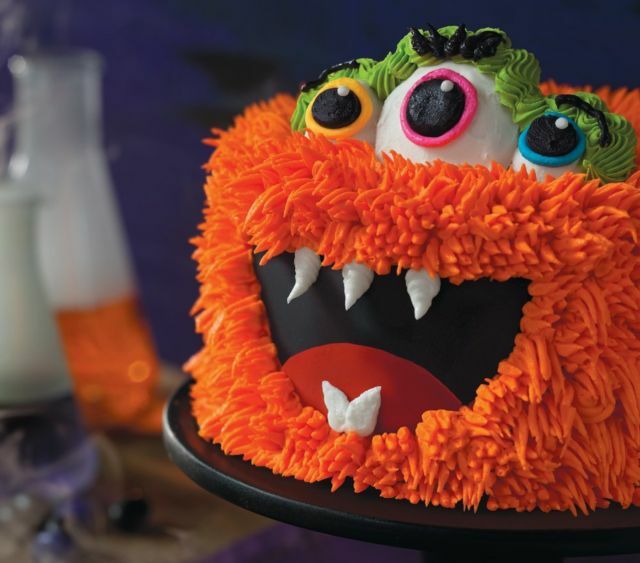 The Fang-Tastic Monster Cake is made to look like a monster with orange fur. It can be customized with your choice of ice cream and cake. The chain continues to offer a small Cappuccino Blast for $2.99 this month. Made with coffee, milk, and ice cream blended with ice, it can be customized with your choice of ice cream including seasonal flavors such as Pumpkin Pie, Caramel Praline Cheesecake, and Banana Nut. They're also running a special where select ice cream cakes are available starting at $12.99. The selection includes new Oreo Cookie Crumb Mini Roll Cake, a round ice cream cake crowned with chocolate sauce, whipped topping, and Oreo cookies, and the Celebration Mini Roll Cake, a roll cake decorated with colorful frosting ribbons. Finally on October 31, 2018, you can get any regular or kids-sized scoop of ice cream for $1.50 at participating locations nationwide.